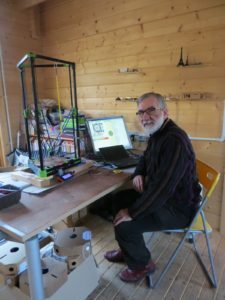 3D printing is a familiar activity at York Hackspace but John Robinson, one of our members, has in particular done a lot of modelling work with OpenSCAD. 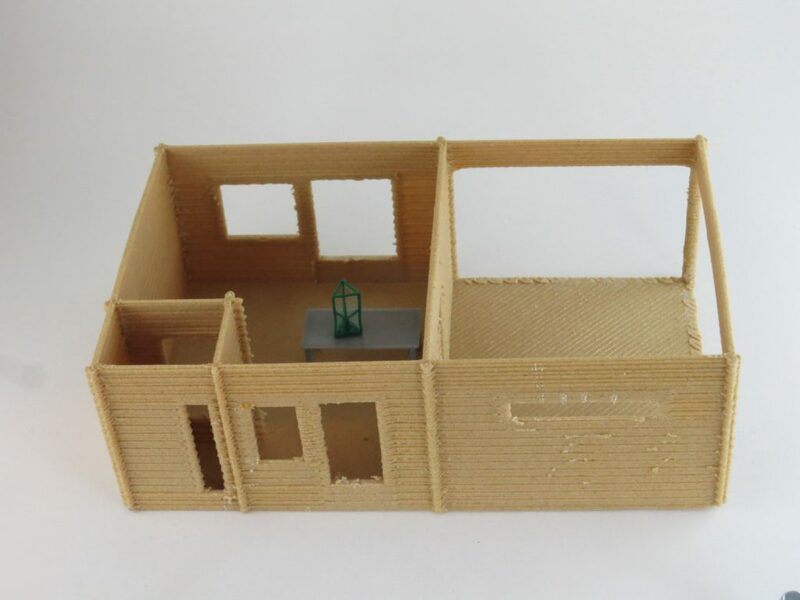 Amongst other things, he prints small animals, decorations, accessories, buildings, and geometric designs on his (rather well-calibrated) delta 3D printer. 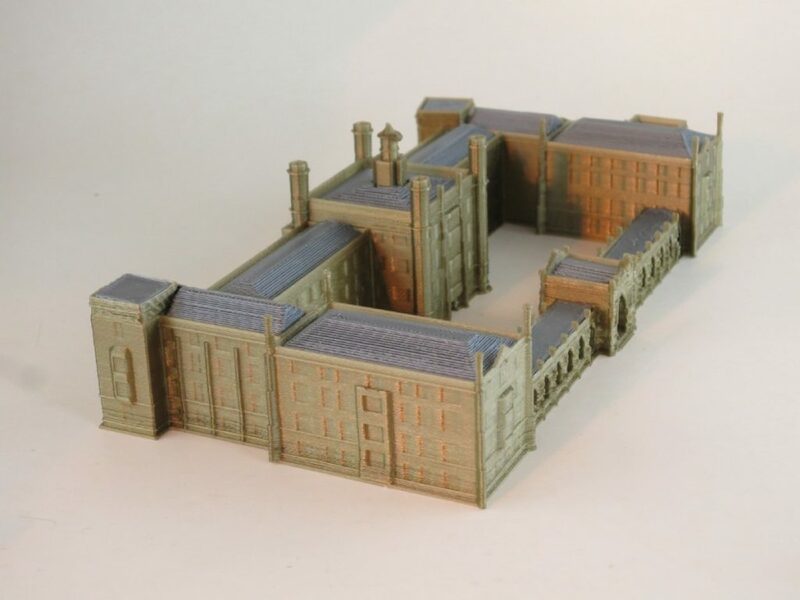 Recently, John and his prints have featured on the St John’s College, Cambridge Alumni blog, after his work on an intricate model of New Court came to their attention. You can check out their full article, presented as an interview with John, here – a few pictures of his prints are reproduced below. We were going to write a post a few weeks ago about our new laser cutter. Unfortunately, after a relatively short time, it stopped cutting. This post is about how we’ve gone about diagnosing the problem, since it’s hard to find this sort of information online. Before I get into things, please be warned: Lasers used for cutting are extremely hazardous – the diffuse radiation from the laser can blind you without staring into the beam, and the carbon dioxide lasers commonly used produce a beam which is mostly invisible! Additionally, the power supplies produce extremely high voltages (on the order of 25kV – that’s enough to cross a significant air gap), and can supply enough current to produce a lethal shock (it only takes 27mA). Don’t do this unless you know what you are doing – and even then, please have someone working with you. That being said, let me get on with the article! Firstly – some basics. I’m not a laser expert by any means, but I’ll attempt to describe the requirements around the operation of one. A carbon dioxide laser relies on electrical excitation of the gas molecules to produce radiation, which leads to laser operation. To excite the gas, a high voltage must be applied to the tube, which ionises the gas and “strikes” the tube. Once ionised, the gas begins to pass electrical current, which then sustains the laser operation. For our tube, around 25kV is required to strike it, after which the voltage reduces to around 2kV. The power supply regulates the current supplied, to stabilise the power output of the tube. We’d already eliminated the basics – mains power issues, fuses, etc. The next thing we checked was whether there was any sign of laser power. Once we’d determined there was no sign of laser activity, we flipped open the laser cover to observe the tube. We could see some faint glowing around the electrodes, which suggested that there was some ionisation of the gas, but not enough to strike the tube. The first thing we attempted to rule out was the panel controls. We found the data sheet for the laser supply. The power supply has a regulation input of 0-5V, which controls the current to the laser. On our cutter, this is directly wired to a potentiometer on the front panel. We checked this using a multimeter, and verified that the output varied smoothly, with no jumps or dirty spots. We also checked that the test button was able to drive the input terminal on the power supply, that the panel ammeter was able to pass current, and that the wiring was sound. Since we had no guarantee that our laser tube was OK, we needed to create a test circuit that “looked” like a laser tube to the power supply. This would then provide a means to check whether the power supply was able to produce the high voltage required to strike the tube, and whether it was capable of supplying the current to sustain operation. Since testing the supply’s sustain current was the simplest thing to do, we calculated an appropriate resistor value to load the supply. As we knew our tube was a 40W model, and worked at about 20mA current, we chose a 100kOhm resistor (20mA into 100k produces 2kV, 2kV x 20mA = 40W). We purchased a large, high wattage ceramic coated resistor for this, both to ensure sufficient power dissipation, and to be certain the high voltage wouldn’t arc over the resistor. The resistor was wired in instead of the laser, and we used the earth terminal on the cutter’s chassis as the return path, after verifying that this connected to the power supply’s return terminal. 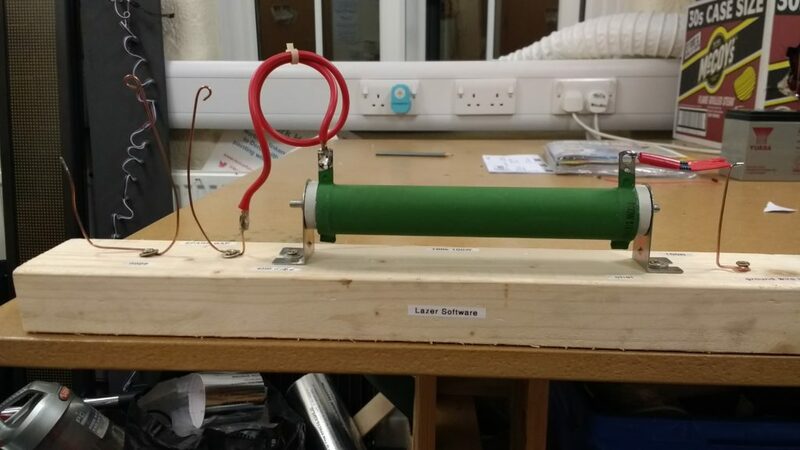 We also connected a 100 ohm resistor in series, at the earth side of the power resistor – this provided a 1000:1 resistance ratio, which was suitable for connecting a voltmeter to, so we could see the voltage produced by the supply. We began testing with our control potentiometer turned all the way down, and tested for a few seconds at increasing levels. The result showed a gradual increase in current with no sign of a problem. We then held the supply at its maximum current (which was about 18.5mA) for 10 seconds to check it produced a steady current. To test the striking voltage, we used a simple spark-gap setup in series with the resistor. Dry air has a breakdown voltage of about 3kV/mm. We used some bare copper wire to assemble a simple gap which could be varied by bending the wires. While this didn’t provide a way to directly measure the striking voltage, the gap would provide an approximation – with the rest of the circuit acting as a realistic dummy load and providing a means to check the current and running voltage. Starting with a gap of about 1mm, we tested the supply. At 1mm, we got a nice clean purple arc. Increasing the gap, we got to around 3mm before we hit trouble. At this point, the breakdown voltage was about 9kV, but the supply would only strike with the control potentiometer in a particular position, and wouldn’t sustain operation. Increasing the gap further resulted in no striking at all. As the laser required around 25kV to strike, this setup should have worked up to a gap of about 8-9mm, so we were quite far off. This seemed to indicate a problem with the power supply – most likely, some form of insulation breakdown in the flyback transformer. We’ve since ordered and installed a new power supply, and I’m pleased to report that the laser cutter is now back in working order! This is the third post in a multi-part series about viewdata. A few members of the hackspace are working on a project to connect a ZX Spectrum with Prism VTX 5000 modem to an emulation of a viewdata system, providing a live demonstration experience. A word in advance – this post is quite theory-heavy, and contains quite a bit of technical information. However, hopefully it’s of interest to people. You can find the complete source code for my softmodem at https://github.com/aquila12/v23. Modems for viewdata systems use Mode 2 of the ITU V.23 standard for communication. 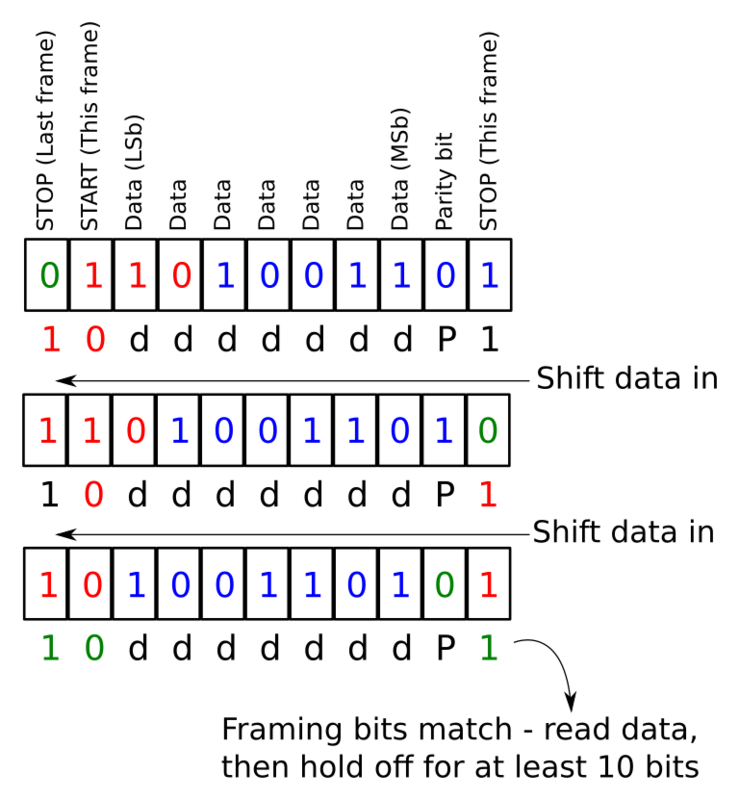 This specifies the signal format for encoding the data as transmitted across a phone line. Mode 2 allows a maximum of 1200 baud operation, and specifies the mark (logic ‘1’) and space (logic ‘0’) frequencies as 1300Hz and 2100Hz, respectively. The standard also specifies a backward channel running up to 75 baud, using 390Hz and 450Hz for mark and space, respectively. Viewdata uses the faster forward channel to deliver data to the customer’s terminal, while key presses are transmitted immediately over the backward channel. With the standard 7-bit ASCII data, even parity bit and the stop and start bits, the frames are a total of 10 bits long – so the forward channel can relay 120 characters per second, with the backward channel running at the much slower 7.5 characters per second. Viewdata frames are up to 40 characters wide, with 24 lines. This divides out neatly so that three complete lines of of non-escaped data can be sent each second (escape codes are used for display attribute changes), with a full frame taking around 8 seconds to transmit. While a regular V.23 compatible modem could be used, these are somewhat rare now. To communicate with the Prism, we decided to use a software modem. While we’d had some success with minimodem, I found it slightly problematic to use in practice. On my laptop, it used a lot of CPU to demodulate signals, and it struggled to synchronise with the incoming data. I decided to put my somewhat rusty signal processing theory to practice and wrote a V.23-only softmodem to use for this project. My aim was to avoid performing any fourier transforms (e.g. FFTs) on the signal, as these are computationally expensive, and instead stick to simple operations such as moving-average filters and differentiators, as these can be made very computationally efficient. My first arrangement has limited success, but was too sensitive to noise. The arrangement, briefly, did amplitude demodulation on the mark and space frequencies, then compared the magnitudes to see which was stronger, and fed the output to a shift register which detected the serial frames. Once I’d thought a bit more about the problem, I decided to attempt demodulation using an approach more suited to the frequency-shift-keyed modem signal, which produced much better results. I’ll describe that in more detail here. Taking an input signal, I multiply on a complex local oscillator which runs halfway between the mark and space frequencies. This essentially moves the frequency spectrum down to DC – anything lower than the oscillator is seen as a “negative” frequency, while anything above is seen as a “positive” frequency – see the image below for a brief illustration. For a complex (I-Q) oscillator, this means that the direction of rotation of the output vector tells you whether the dominant frequency at the input is above or below the local oscillator frequency. It’s worth mentioning that multiplying on the local oscillator doesn’t just “move” the spectrum – it causes two copies. One is shifted down around DC (the “difference” spectrum), while the other is shifted upwards (the “sum” spectrum). Because of this, and also because the input isn’t completely clean (in fact, it might contain other signals), the signal must be filtered before determining the direction the vector is rotating in. I used a moving-average filter for this. Moving-average filters are very simple – essentially the samples between two points in time are summed. This is easy to implement efficiently as you only need to keep track of the samples within that period, and keep a running total. As each sample is added to the total, the sample added least recently is subtracted and removed from the buffer. These filters have a very characteristic transfer function (i.e. what frequencies they reject). 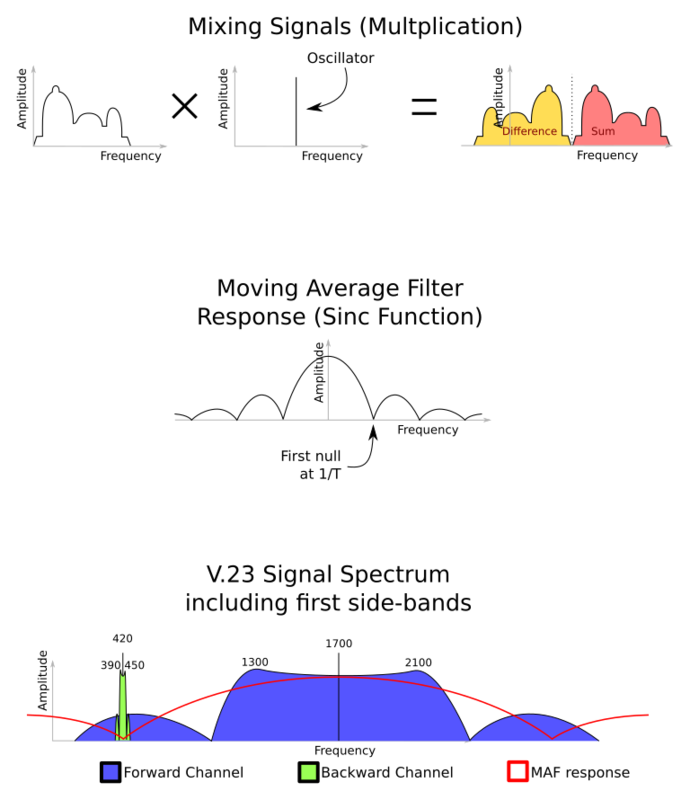 The moving-average filter completely rejects signals at regular frequencies, and those frequencies occur depending on the period the filter is averaging over – the illustration shows the shape of the response. I used this fact to specifically tune the demodulation filters. When demodulating the forward channel, I placed the first “null” to eliminate the backward channel signal as much as possible (as in the picture), as the backward channel is within the side-bands of the forward channel. For demodulating the backward channel, since the band is quite narrow, I just placed the first null so it was away from the frequencies of interest. The filtered signal is then passed to a function which determines the current phase of the vector. This essentially divides the vector components to produce the tangent of the phase angle, and then passes that through a function to determine the angle. As the precise angle isn’t important for this, I used a simple approximation for this – the tangent function, between -45° and +45°, is nearly a straight line, and it’s straightforward to replicate this approximation through the entire circle by flipping the division upside down to stay in this quadrant. Once the phase angle is determined, we just need to average its change over each bit, and use the sign of this (positive or negative) to correctly demodulate the signal. The simplest way to write this was to take the derivative of the phase, and then run this through a moving-average filter. The output is then fed to the same frame-detection routine as I’d drafted for my first attempt, which I’ve illustrated below. I’m aware this topic has been quite in-depth as far as the implementation goes, but I’m hoping it makes some sense to those of you who perhaps dabble in filters or radio-related topics! If you’d like me to expand on anything I’ve discussed here, please get in touch and I’ll do my best to address your query. Next time, I’ll talk a bit about the viewdata frame format and how we’re writing our frames. This is the second post in a multi-part series about viewdata. A few members of the hackspace are working on a project to connect a ZX Spectrum with Prism VTX 5000 modem to an emulation of a viewdata system, providing a live demonstration experience. Viewdata connections, much like dial-up internet access which followed later, relied on audio frequency telephone communication to transfer data between the user’s terminal and the information provider they were logged into. I’ll cover details of the signal modulation in a separate article; in this article I’ll describe how I connected a real Prism VTX5000 modem to a laptop’s sound card. For the purposes of our simulation, we only need the line simulator circuit to behave like a line in the off-hook state. This means it can run from a low-voltage supply of 9-12V. We’re also not interested in providing a ring signal (typically around 90V AC), as it’s also not required for this project. On a telephone line, the AC audio signal sees a resistance of around 600 ohms. Audio signals are coupled to the phone line via capacitors, which pass the audio signal but block the DC supply. 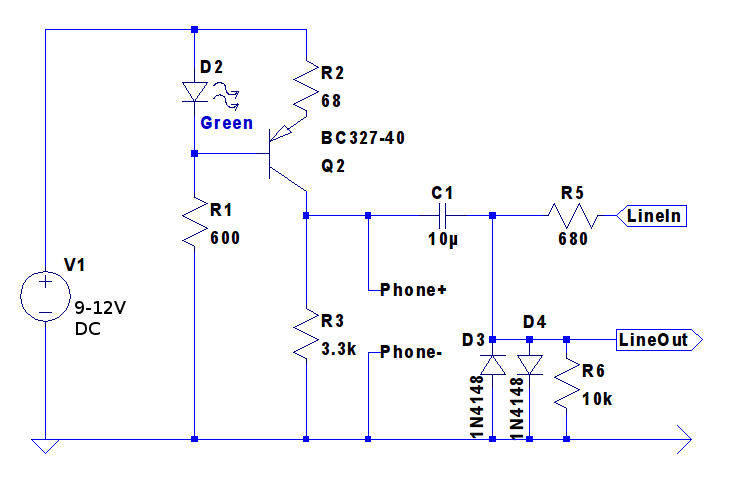 Starting with the DC requirements, a fairly simple transistor circuit can be made to act roughly like a current source, up to near the circuit’s supply voltage. Adding a bypass resistor permits the introduction of a controlled dynamic resistance at DC, and this also affects the off-hook voltage level. To provide the required AC resistance and injection capability, the circuit can be coupled via a capacitor and series resistor to the laptop’s headphone jack. A second resistor to ground helps to block the DC supply. A headphone output has a very low resistance of a few ohms at most. A 680 ohm resistor increases this to a more suitable level. While this is slightly on the high side, it leaves some room for other parallel resistances of a few kilohms, which the circuit will introduce. The protection and take-off requirements can be met simply by placing two signal diodes in inverse-parallel; this limits the line signal to 0.7V peak, and also limits the extent of transients when the line switches between on- and off-hook conditions. The complete line simulator circuit is shown above. The LED and series resistor are used to provide suitable biasing to the transistor. 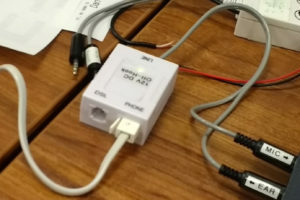 An unintended side-effect is that when the phone is on-hook, the LED supply is bypassed by the transistor, so the LED also acts as an off-hook indicator. This circuit can easily be built on a small piece of stripboard. ADSL filters are widely available, and often going spare. These provide a suitable project box and, with the rest of the filter components removed from the board, a pair of phone jacks which can be connected to the line simulator circuit. Note that the circuit as presented is not suitable for connection to a PC microphone jack as the signal level is far too high; to use this an attenuator would need to be built in, which could be achieved with a simple resistive divider. Once constructed, check the voltage at the phone socket is about right, then plug in an old phone to check it’s working. You’ll probably hear some quiet line noise, and the LED should light when the receiver is lifted. If you connect the circuit to a laptop or music player, you should be able to hear audio played clearly through the phone, complete with that lovely tinny quality. This is the first post in a multi-part series about viewdata. 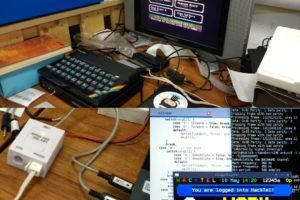 A few members of the hackspace are working on a project to connect a ZX Spectrum with Prism VTX 5000 modem to an emulation of a viewdata system, providing a live demonstration experience. Back in the early ’80s, before the world wide web was a thing, there was something a little like Teletext called Viewdata. Viewdata pages look a lot like Teletext – they share the same frame formats – and viewdata terminals likely used the same IC to produce the video signal (The Mullard SAA5050, also used in the BBC Micro for its text-only mode). While teletext pages are transmitted in the blanking interval of a TV signal, in rotation so a receiver needs to wait for the right page, viewdata operates over a telephone line and so is more interactive. When a subscriber wanted to log onto the service, they dialed the provider they wanted to access – for example Prestel – and provided their ten-digit ID number and password to log in. Once logged on, the user was presented with the main page, and navigated using the number keys and enter. Pages were generally arranged hierarchically, so page 1234 would be below 123, and is reached from that page by pressing ‘4’. Like Teletext, viewdata pages could consist of multiple frames, so pages longer than one frame could be constructed. Companies who wanted to host information on a viewdata service would pay the information provider (IP); this would involve a payment for a particular length of prefix (shorter prefixes would typically be more expensive), and also per page hosted. They could edit frames using special editing software, and then uploaded these to the IP. Frames weren’t restricted to being completely passive – “submission” frames could be authored, allowing people to order goods or fill in forms. Frames could also be marked with a cost, allowing companies to collect money against a user’s account when they accessed the information. Often, information providers would have a mailbox system, allowing users to send each other messages, which could be retrieved and read when the user logged in. Some terminals would allow these, as well as other frames, to be retrieved and stored locally, so they could be read offline without the user keeping the line open. As well as centralised information providers, such as BT’s Prestel, software later emerged allowing people to host their own viewdata systems – often bulletin boards – or set up peer-to-peer connections. Peer-to-peer connections allowed users to phone each other, and as long as they set their modems correctly, information could be transferred half-duplex. Bulletin boards could be run on systems such as the BBC Micro, and would present themselves in the same manner as an IP. The modem standard – v.23 – used for viewdata is asymmetric. The forward channel (download) runs at 1200 bits per second (120 characters per second taking framing into account), while the reverse channel (upload) runs at 75 bits per second (7.5 characters per second). A terminal – apart from any storage functionality – is relatively “dumb”, and transmits key presses immediately. The information provider’s system reacts as needed – whether this means sending a new frame, or echoing characters typed into a response frame. The slow reverse channel is still generally fast enough to transmit the user’s keypresses, and is fairly noise-resistant because of the low bandwidth. There are sites which contain demonstrations of some viewdata systems – https://www.viewdata.org.uk/ is a good example of this. Follow the “Logon Now” link to access an example. Back in August, we moved into Stonebow House along with the Arts Barge people. As the developers now want to start doing work on the building, we’ve moved out. 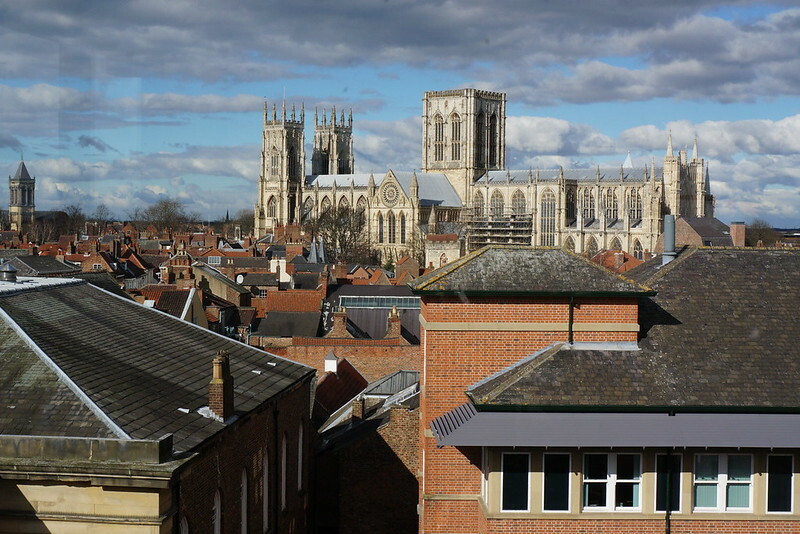 From the fourth floor, with no working lift, there was a lot of manual handling down the narrow fire escape to the car park with all our gear! 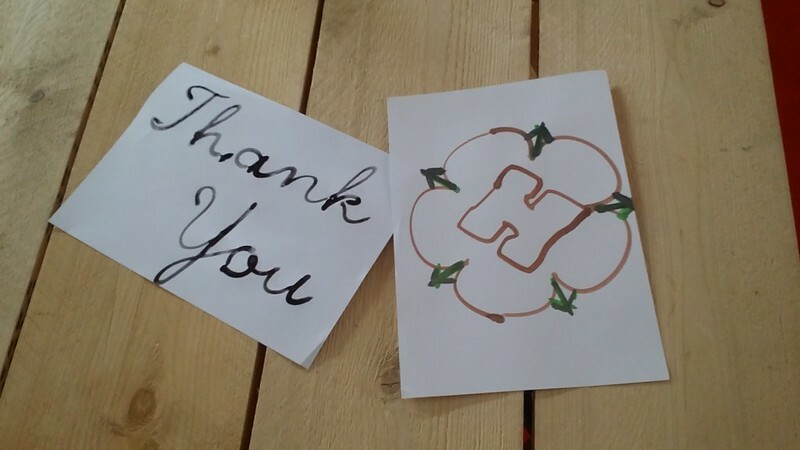 Having a temporary space to use when we like has been a great thing for the Hackspace (and not just because of the beautiful views either) – it’s attracted some new members, and given us a chance to see what freedoms that offers. Being able to leave tools and gadgets out has given us a great community feeling, and it’s certainly saved me a lot of backache carrying my stuff to and fro. Sharing with the other artists has also been really enjoyable – we’ve seen people doing all sorts of creative things, and we’ve had a fair amount of interest in our own work too. We’re still working on finding “Hackspace 3.0”, so watch this space (and if you know anyone who might be able to offer us cheap office space, please let us know)! We’ll continue to meet weekly in the Black Swan (or other pub as agreed) to keep the momentum going until we have a new space. On Saturday we took SpaceHack to Leeds to a Raspberry Jam event set up by Alan O’Donohoe and Claire Garside as part of their great JamPackedUK roadshow, in partnership with the Raspberry Pi Foundation and Google.org. The day was well organized, and there was a variety of things to do and toys to play with. Makey Makey was set up with PlayDoh (and sweets), and was connected to a Pi running scratch, so people could program with it. Sonic Pi was also set up, which was fun to play with, and there was a demonstration set up with BareConductive paint. 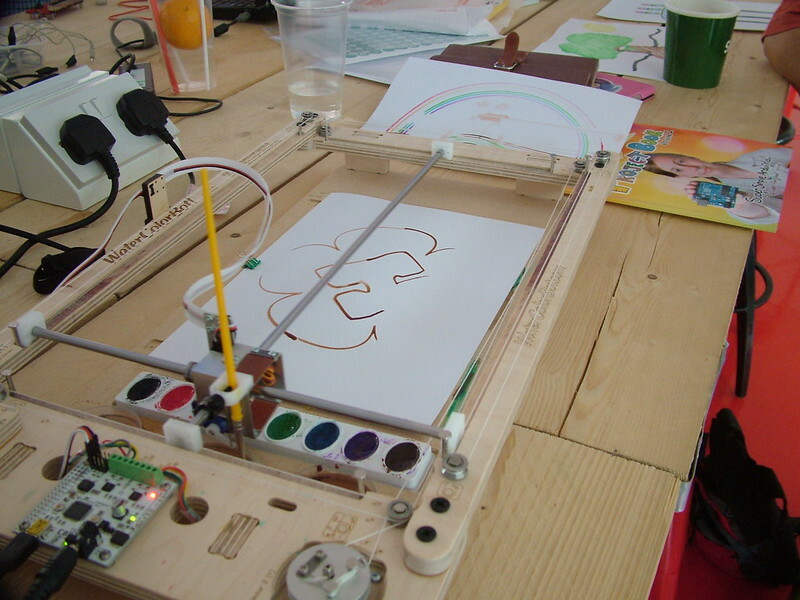 My personal favourite was WaterColorBot, a robot that can paint pictures with block paints. Bob even got it to draw our logo! Apart from the ready-to-go demonstrations (which were very fun and interactive), there was also an area set up to tinker with some Raspberry Pi, and a room upstairs for the workshops that were running. As usual, we had plenty of folk playing SpaceHack, and it was great to see so many different people around – teachers, kids, and other hackers. 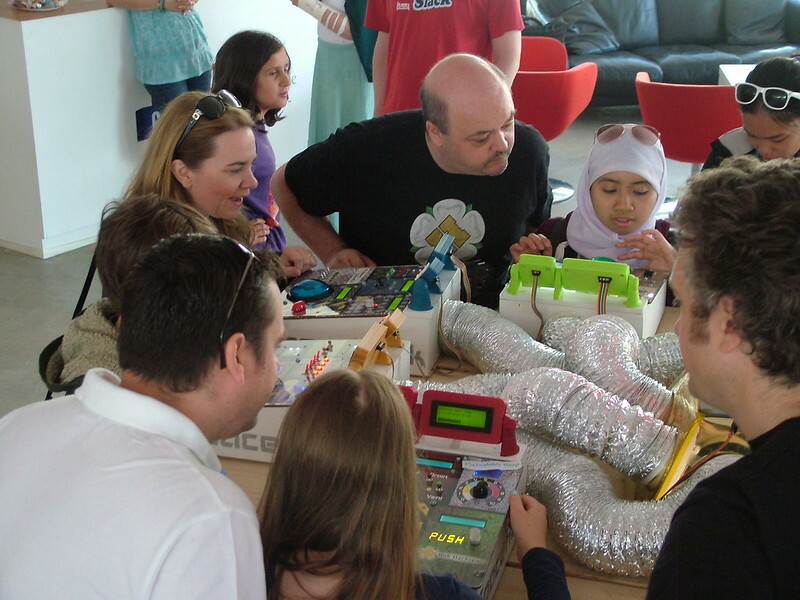 There were a few members from Preston Hackspace, who are relatively new; it’s always nice to see other local groups starting up! All in all, it was a great day out, topped off nicely by the free water taxi back to the station!